Get tickets for your chance to meet Top Fuel Legends Shirley Muldowney and other iconic NHRA Legends at the AAA Texas NHRA FallNationals! Texas Motorplex is one of five all-concrete dragstrips on the schedule (the first of its kind when it opened), which allows crew chiefs the opportunity to achieve national record performances. The event is the fourth of six chances for Countdown to the Championship teams to earn points toward Mello Yello world titles. As always, fans will have the opportunity to interact with their favorite drivers at the most powerful and sensory-filled motorsports attraction on the planet! Get direct access to the teams, see firsthand as the highly-skilled mechanics service their hot rods between rounds, and get autographs from your favorite NHRA drivers. Tickets can be purchased online by clicking the TICKETS button above or by calling 800-668-6775. Purchase early and save! How to Get There: The track is on Highway 287, two miles west of Ennis and eight miles east of Waxahachie between interstates I-35E and I-45. From Dallas, take I-35E south to Exit 403, then Highway 287 south (east) 10 miles to the track, or take I-45 south to Exit 251B, then Highway 287 north (west) five miles to the track. From Fort Worth, take Highway 287 south (east) eight miles past Waxahachie to the track. 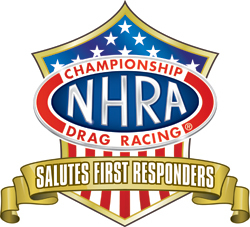 As part of the tribute, first responders will be eligible for discounted tickets to the AAA Texas NHRA FallNationals through GovX. Click here to purchase.